Gilt, currently valued at more than $1 billion, was launched by Alexis Maybank, Alexandra Wilkis Wilson, and three colleagues in 2007. It is one of the most fascinating startups of recent years. And it all began with one bold idea: to bring sample sales online and change the way millions shop. There is an old maxim that friends should not do business together since it invariably ruins the friendship. The Information Age has disproven this notion as best friends and college roommates have launched enterprises that eventually become billion-dollar companies (Microsoft and Google are two notorious examples). 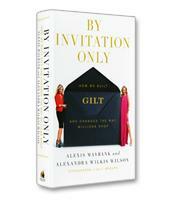 Perhaps one of the most engaging stories of friendship turned into entrepreneurial success is told in By Invitation Only by Alexis Maybank and Alexandra Wilkis Wilson. The relationship between Harvard Business School graduates Maybank and Wilson is so tight that the pair is known as A&A. However, By Invitation Only is more than a story of friendship, it is a story of how two smart young women leveraged their experience, intelligence, contacts, complementary personalities, careers, skills, and a passion for fashion into an innovative online enterprise called Gilt Groupe. The Gilt Groupe — co-founded by Maybank, Wilson, engineers Mike Bryzek and Phong Nguyen, and chairman and veteran online entrepreneur Kevin Ryan — is based on the idea of the "sample sale," in which a very select group of customers is invited to buy (during a very small window of time) luxury brands at discount prices. "To savvy, fashion-conscious New Yorkers, a Louis Vuitton or Hermès sample sale was a drop-everything-and-run proposition," the authors write. "Once there, you basked not only in the bargains, but in being part of (and often trampled by) an elite, stylish, in-the-know crowd." Gilt essentially brought sample sales to the Internet. The idea began with Ryan, whose French wife discovered a French "luxury private sale" Web site. Through a recruiter, Ryan was put in contact with Wilson, who had followed Harvard Business School with stints at Louis Vuitton and Bulgari. Uneasy with the idea of an Internet business, Wilson suggested her best friend Maybank instead. Maybank joined Ryan but eventually realized that Gilt needed a high fashion insider with the right contacts and personality to lure the right high-end brands to the site — a job description perfect for her best friend, Wilson. By Invitation Only describes the successful entrepreneurial journey of Gilt, revealing to readers the exhilaration and terror that launching, growing and managing a start-up inevitably brings. More than just telling a story, however, Maybank and Wilson want to help readers succeed in the way that they have succeeded, and therefore offer specific advice, often in the form of boxed checklists, on moving from an idea to a profitable enterprise. Extensive networking, for example, was a key factor in the successful launch of the site. In a chapter entitled "Networking to a Launch," the authors offer a checklist that explains the rules for growing and maintaining your network. Another chapter describes how the co-founders laid the foundation for their viral business model. This chapter includes a checklist that enables readers, through a series of questions, to evaluate whether their business has the potential to be viral. At the heart of the book, however, is the continuing friendship and collaboration (in that order) of Maybank and Wilson. The ultra-organized and cautious Wilson and the spontaneous, risk-taking Maybank complement each other perfectly. In an era in which company founders can end up on opposite sides of a courtroom, the story of the partnership described in By Invitation Only should be a primer for any friends considering going into business together.